Are you looking for an SUV that can go off-road, but still rides smoothly on the highway? 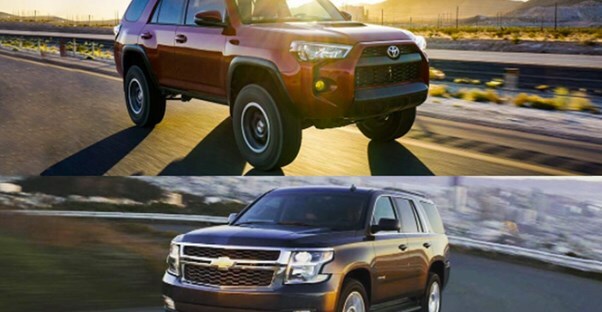 The Chevrolet Tahoe or Toyota 4Runner could be your next vehicle. These are two extremely popular models, but they're very different. Our breakdown can help point out the biggest differences between the 2016 Chevrolet Tahoe LS and the 2016 Toyota 4Runner SR5. The first thing many people look at when they’re getting a new vehicle is the price. How long will they be making payments? There’s actually a pretty large price gap here. The Chevrolet Tahoe has a starting MSRP of $47,000 for the two-wheel-drive LS model. Compared to the 4Runner, this is a high cost. The starting MSRP for a Toyota 4Runner SR5 is $34,010, over $10,000 less than the Chevrolet model. The Chevrolet Tahoe has a 5.3-liter engine and gets an estimated 16 mpg in the city and 23 mpg on the highway. The Toyota 4Runner has a smaller 4.0-liter engine, but gets a similar fuel economy at 17 mpg in the city and 22 mpg on the highway. The Chevrolet has more power, with a stronger engine, but has a similar fuel economy. That's not bad. Are you going to haul a boat or hook up a trailer to your SUV? You need to know how much it can tow. Since the Chevy Tahoe has such a large engine, it can tow more with a maximum of 6,400 lbs. to 6,600 lbs. Even though the Toyota 4Runner has a smaller engine, it can still tow 5000 lbs. That 1,000-pound difference may tip the scale, or it may be more than you need. Either way, it’s good to know. What else can your SUV do? Since the Chevy Tahoe is so much more expensive, you’d expect it to have more features. This SUV comes with keyless entry, seating for eight, USB connections, six total speakers, auxiliary audio input, and three months of free satellite radio. Unfortunately, it doesn’t come with Bluetooth connections. The 4Runner is less expensive but comes with more features standard. It has a complete entertainment suite with eight speakers, a 6.1-inch high-resolution touch-screen display, auxiliary audio jack, USB ports, advanced voice recognition, hands-free phone capability, Bluetooth connection, HD traffic and weather reports in major metro areas, integrated backup camera, and three months of free SiriusXM satellite radio. Even though the 4Runner only has seating for five, it’s clear that the 4Runner is the winner here. You want to keep your passengers safe, so what do these SUVs have to offer? The Tahoe has an anti-theft system, tire pressure monitor, electronic stability control system, and optional lane departure warnings for an extra cost. The Insurance Institute for Highway Safety gives the Tahoe an acceptable rating for child seat anchors, but little to no testing. The Toyota 4Runner comes with a Star Safety system which includes Vehicle Stability Control, Traction Control, Anti-lock Brake System, Electronic Brake-force Distribution, Brake Assist, and Smart Stop Technology. The 4Runner has a lot more crash test ratings than the Tahoe and scored well on four out of the five crashworthiness tests.